“These mangoes are different from the ones we have in Delhi Mamma!” said my five-year-old yesterday morning. “Really? How?” I was surprised. “They are sweeter and juicier,” Malhar enumerated. “You think so, baby? Great! Yes, they are Himsagar. Mangoes Mamma and Papa grew up on. You only get them in Calcutta.” An appreciative nod later, the fork went back in action. All I could do was smile to myself. The whole day was packed with activities that one would expect off a five-year-old hyperactive boy. Exploring hidden crannies of the kitchen to discover a rusty old cleaver and pretending to be Thor with it! Accompanying the granny to the garden and poring over a fledgling anthill... Or demanding ice cream by the minute because its vacations in aGranny home! I can’t begin to tell you the rest that makes me marathon behind this Dennis of mine. But it’s super fun and a natural workout. Why I mentioned the aforesaid conversation is because I make it a point to smile and appreciate my baby when he impresses me. And he understands that. The praises have made him more perceptible and expressive. He observes and he can enunciate. If there is something amiss he notices that. And I notice that he notices. That is what a child needs. Notice. When he does something good. 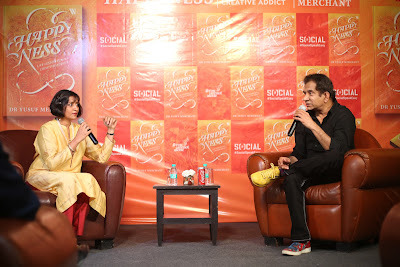 I smiled to myself when Dr Yusuf Merchant said the same thing at the launch of his third book, Happyness: Life Lessons from a Creative Addict last week amidst a crowd who intently listened to his cheerful chatter and discourses. But as a parent, my ears immediately perked up when I heard him talk about what to do to make sure your child is happy. “Don’t pay attention to the wrongs your kid does. Pay more attention to the rights. This will ensure a morale boost. And he shall be happy. If parents were to realise that and not go cribbing about how difficult he has been... If you smile and pat him for a good deed once a day, he doesn’t have to go ransacking the rest just to get you to notice him,” said the amiable doc. What a jewel that was and it sent the entire audience into a nodding fit. Because, this time truth wasn’t bitter. The ever-smiling doc is the founder and president of Drug Abuse Information, Rehabilitation and Research Centre (D.A.I.R.R.C) and affiliate member of the United Nations Economic and Social Council. 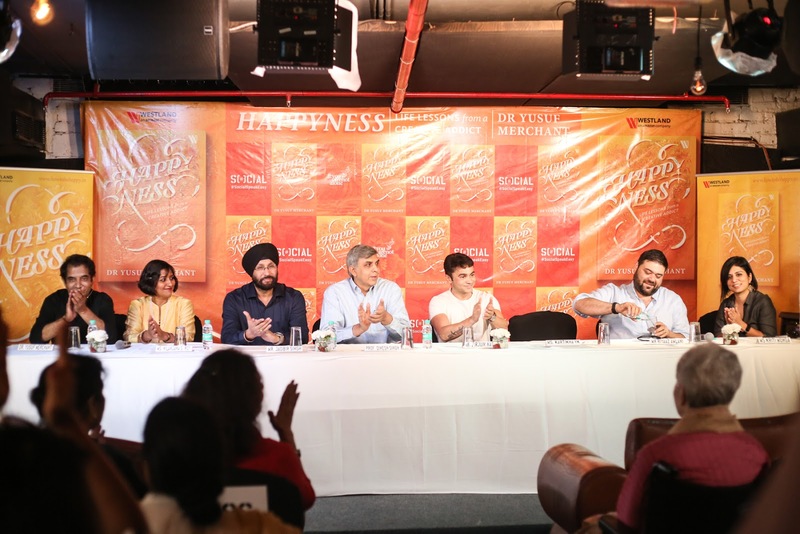 And this happens to be his third book that was launched at Hauz Khas Social in the Capital amongst a luminous set of guests including Prof. Dinesh Singh (Ex VC of Delhi University), Jagbir Singh (Ex Hockey Captain of India), Riyaaz Amlani (C.E.O. & Managing Director - Impresario Entertainment & Hospitality), Arjun Nath (Author and Legal Expert), Karthika V.K. (Publisher – Westland-Amazon books), Kriti Monga (Artist and Graphic Designer) and Nilanjana S. Roy (Author & Publicist). The book focuses on easily implementable life changing tools for people wanting to lead happier lives, and represents the culmination of Dr. Merchant’s experiences, both as a man, and as one of the leading behavioural therapists in the world. “I have, through my suffering, developed a handy life changing formula that has worked for me, for the recovering addicts I live with, and their families. This book is an endeavour to reach out beyond my circle of influence.” He maintains that happiness is a choice and a process derived by a good value system, and not merely an outcome. Concepts such as belief, gratitude, imagination, visualisation, love and awareness are described in detail to arrive towards happiness, in his book. One of the moot points that I brought back with me was that one needs to keep oneself busy, active. It is in inaction that one tends to drift towards the pensive state. I came back to tell my husband why I feel so useless when there is nothing to do! My husband complains that I cannot take things easy and I am eternally stressed. He isn’t wrong. But I must tell you this. I have started discovering wherein lies my peace. I have never been a party hopper. I love meeting friends, new people and listening about their journeys. But the most beautiful moments are spent at home, with my family. I think once you are able to decide what makes you smile, the road to a calm state of mind becomes a little less difficult. And when there is an iffy jerk, talk it out. Talk to someone who you trust and who listens. And if you don’t trust anyone out there with your secrets, book an appointment with the happy doc. 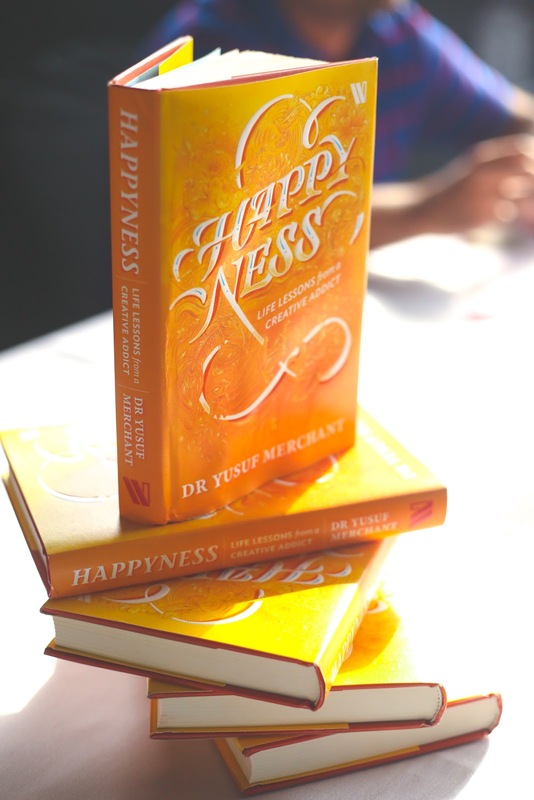 This book is especially timely, especially when a large amount of attention, across the globe, is geared towards the state of human happiness. The United Nations has been publishing World Happiness Reports for the past five years and March 20 has been International Day of Happiness. However, research reports by the UN, suggest that one in every four adults today is unhappy due to mental issues relating to depression and anxiety. According to the UN World Happiness Report 2017, India’s happiness levels have dropped by 0.839 points on a scale of 2.7 and is currently ranked 122 out of 155 worldwide (with 1 being the happiest country). Therefore, there has been an increase in the search for happiness. The ever-growing attention that mental health and wellbeing are currently receiving, and Dr. Merchant’s vast experience, in this field, led him to write the book on creative techniques and perspectives to deal with the emotional struggles of everyday life. By bringing together scientific theories on the functioning of the brain and how it alters under stress, as well as existential questions on karma and the meaning of life, he weaves a vivid and impactful account on some of the basic tenets of leading a fulfilling life. P.S. The book is now available on Amazon.in, bookstores, and at a Social outlet near you.